1872 3d Rose, SG 103, Plate 8. A very fine used CDS Block of Four. Cat £425. 1804 Entire from Litchfield to Willersley near Wirkswortth showing a LITCHFIELD/119 mileage and a very fine MISSENT/to/BIRMINGHAM, BM 164. Contains a interesting family letter; a member of the famous Industrial Revolution Arkwright family. 1857 1d Rose-Red, SG 40, tied to entire to Dublin by a SUPERB TYPE B WOLVERHAMPTON Spoon duplex. 1840 Cover addressed to Iron Bridge with, on the front, a "STAFFORD/MR 1/1840/✠" Skeleton datestamp, ST 601. Very Scarce. 1863 1d Rose-Red, SG 40, tied to envelope from Leeds to Bedworth showing a VERY FINE "MISSENT TO" TAMWORTH. VERY SCARCE. 1857 1d Rose-Red, SG 40, tied to Entire to Whitehaven by a VERY FINE TYPE B WOLVERHAMPTON SPOON DUPLEX AND SHOWING ALONGSIDE "MISSENT TO" MILNTHORPE. Scarce and Attractive. 1838 Entire addressed to Edinburgh showing a fine NEWCASTLE/5" Cl.Post in red, ST 472. 1878 2d DEEP BLUE POSTAL STATIONERY ENVELOPE franked by a ½d Rose-Red, SG 48, Plate 11 and tied by a very fine LONGTON-STAFF duplex, addressed to Germany, and making up 2½d rate. SUPERB AND AN UNUSUAL USAGE. 1846 Entire to London from Wolverhampton with, on the front, a very fine WOLVERHAMPTON HANDSTRUCK '2' POSTAGE DUE in black, ST 970. 1841 Entire to Shifnal showing on the front a very fine oval-framed WEST BROMWICH UNIFORM HANDSTRUCK 'PAID/ONE/PENNY' in red, ST 860. 1855 1d Pink Stationery envelope to Whitehaven cancelled by a fine STAFFORD NUMERAL ERROR - '780' FOR '730'. 1848 Entire to Wednesbury showing on the front a very fine WEST BROMWICH UNIFORM HANDSTRUCK 'PAID/ONE/PENNY.' in red, ST 862. 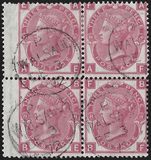 1903 1d Scarlet IR Official, SG O21, tied to OHMS envelope to Hanley by a Stoke on Trent cds. 1825 Entire from Castletown to Lichfield showing a very fine ISLE OF MAN, IM 10, 42 X 3.5 mm. Ex Whitney. 1799 Entire to Rochdale showing on the front a very fine NEWCASTLE/UNDER/LINE Reversed Horseshoe, ST 419. 1840 1d Mulready Letter Sheet addressed to Norwood and cancelled by a very fine NEWCASTLE UNDER LYME Maltese Cross. 1840 2 June, 1d Mulready Letter Sheet addressed to Clifton, sent from Stone via Birmingham and cancelled by a Superb Strike of the Birmingham Maltese Cross in Orange-Red. 1776 Entire to the White Hart, Buxton, showing a fine straight line LITCHFIELD on the reverse, ST 301. 1785 Cover to London showing a fine 119 LITCHFIELD first-type mileage. 1840 Cover to Stourbridge showing a very fine oval-framed WEST BROMWICH UNIFORM HANDSTRUCK 'PAID/ONE/PENNY', ST 860. 1821 Cover to Gravel Pits near Stroud, showing a very fine boxed 'LEEK/154' mileage mark, ST 257.